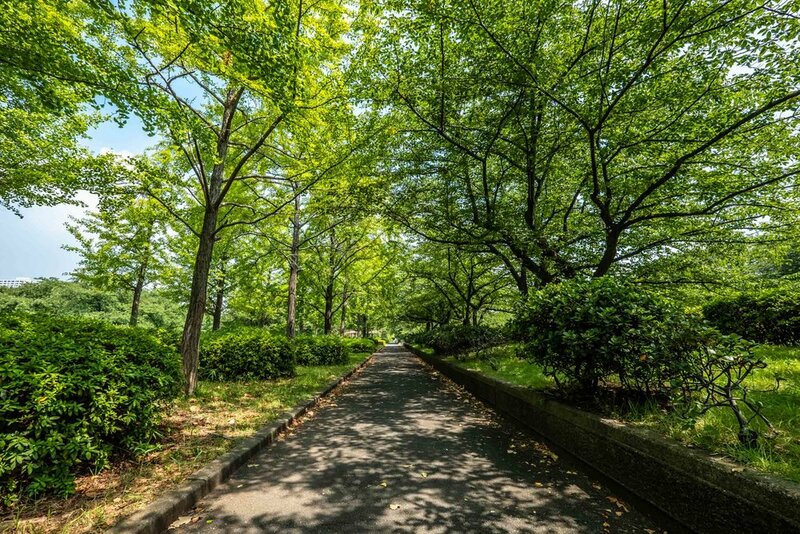 Sarue-Onishi Park was gifted to Tokyo by the Showa Emperor in 1924. Today it is still a very popular park on the east side of the city. You can read about it here and see some pictures of it too! If you are ever on the east side of Tokyo, and in need of some relaxation, Sarue-Onishi Park might be the place for you. It is a kind of a strange park, in that it a major road splits it it two! Originally belonging to the Imperial Family, the southern part was given to the city of Tokyo in celebration of the Showa Emperor’s marriage in 1924 and then opened to the public as a park in 1932. The northern section was used as a lumberyard until 1976 and finally handed to the city to expand the size of the park in 1981. To be bluntly honest, it is a good park, not a great one. Yes, it is extremely green, with lots of trees. However, in my opinion, it does not rank up there Shinjuku Gyoen, Showa Memorial Park or Kiyosumi Gardens. Those parks, and others in Tokyo, are meant to be appreciated, admired. That’s okay, because Sarue-Onishi has a very different purpose in life. It is there to be used. It has all the tools for people, their friends and families to enjoy. If you want to jog, you can do it. If you want to have a picnic, you can do it. If you want to run around with your children, you can do that too! If you want to play tennis or baseball, you can do it as long as you pay the rental fees (contact the park for details). You can do any activity there as long as it doesn’t annoy anyone else. The centerpiece of the park is a clocktower in the middle of a long lawn, that is flanked by cherry trees, from where you can see Tokyo Skytree in the distance. I haven’t been to the park in spring yet, so I can’t comment on how good the trees are in that season (but pictures I’ve seen on the internet look very good). Hopefully, in 2019 I’ll be able to make it back. Another thing that might be of interest is the pond in the northern section. Many years ago, logs were floated down the river into the pond there when it was used as a lumberyard and the stones that ring it now were used back then. Those stones were used as weights and placed on the logs when they were kept in long storage. As for any problems with the park - well, there is nothing else within easy walking distance of the park. You have to go back one of the stations and get another train/subway to another place. And, the park is actually split by a major road, which is a little strange. The last thing is that during summer, the grass can get a little high (but that mightn’t be a bother for some people I must admit). Need a place for a picnic, no problem! If you live in the area, or not too far away, Sarue-Onishi Park is a pretty good place to go. However, if you live far away, there might be better offerings nearer you. You can see its (Japanese) website here. Need a ground for your baseball team's practice, no problem there either! It is very easy to get there as there are two stations nearby. Sumiyoshi is closest, so leave there by exit A3 and you’ll be just a couple of minutes’ walk away. Kinshicho station is a little at about 15 minutes! Meguro Sky Garden – an unusual park … it is above a major road!